It’s hard, perhaps impossible, to pinpoint the exact time and place in which the original concept of Sudoku (Japanese: 数独, sūdoku) began, but it seems to be related to the appearance of the first Magic Squares. According to the on-line magazine Convergence, as cited in the article Magic Squares by Pat Ballew, the idea of the magic square was transmitted to the Arabs from the Chinese, probably through India, in the eighth century. It is discussed by Thabit ibn Qurra, known for his formula for amicable numbers, in the early ninth. A list of squares of all orders from 3 to 9 is displayed in The Encyclopedia, compiled about 990 by a group of Arabic scholars known as the Ikhwan al-safa (English: brethren of purity). No general constructive methods appeared by that time. This article uses material from the Wikipedia article Sudoku and is licensed under the GNU Free Documentation License, which means that you can copy and modify it as long as the entire work (including additions) remains under this license. In 1225, according to the above citation, Ahmed al-Buni showed how to construct Magic Squares using a simple bordering technique, but he may not have discovered the method himself. Biggs, referring to a paper by Camman, suggests that the methods explained by Moschopoulos may have been of Persian origin and be linked to those expounded by al-Buni. Camman indeed claims that the two methods given by Moschopoulos for constructing odd magic squares were known to the Persians, citing an anonymous Persian manuscript (Garrett Collection no. 1057, Princeton University). Even so, this document contains examples and not explicit methods. According to Islamic Medical Manuscripts at the National Library of Medicine first appearance of the Magic Square (known in Arabic as wafq) in Islamic literature occur in the Jabirean Corpus - a group of writings attributed to Jabir ibn Hayyan (known in Europe as Geber), and generally thought to have been compiled at the end of the 9th or early 10th century A.D. The Jabirean Corpus suggested Magic Squares as charms for easing childbirth. These squares consisted of nine cells with the numbers 1 to 9 arranged with 5 in the center so that the contents of each row, column and the two diagonals added up to 15. The numbers were written in the abjad letter-numerals, and because the four corners of this square contained the letters ba', dal, waw [or u], and ha', this particular square became known as the buduh square. By that time, the Magic Square concept became so popular that the name buduh itself was assigned talismanic properties. In subsequent years Islamic writers developed a variety of methods for forming larger Magic Squares, in which no numeral was repeated and the sums of each row and each column and the two diagonals were the same. Magic Squares with cells 4x4 or 6x6 or 7x7 were particularly popular, with 10x10 squares being produced by the 13th century. According to the on-line magazine Convergence, as cited by Ballew, it also appears that Magic Squares may have introduced to Europe through Spain by Abraham Ben Meir ibn Ezra (c. 1090-1167), a Hispano-Jewish philosopher and astrologer. Ben Meir ibn Ezra translated many Arabic works into Hebrew and had a deep interest in Magic Squares and numerology in general. He traveled widely throughout Italy and beyond, and may have been the one of the people responsible for the introduction of Magic Squares into Europe. The concept of Latin Squares has been known since at least medieval times. Arabic Manuscripts from the 13th Century sometimes seem to feature the first Latin Squares, often given mystical of Kabblahlic significance. A Latin square, known in Arabic as wafq majazi, is a square containing cells in which each row and each column have the same set of symbols in distinction from a magic square in which there is no repetition. This chain of events continues with the Swiss mathematician and physicist Leonhard Euler (1707-1783). According to The Euler Archive, in his paper De quadratis magicis (On magic squares), presented to the St. Petersburg Academy on October 17, 1776, Euler showed how to construct Magic Squares with a certain number of cells, in particular 9, 16, 25, and 36. In this document Euler starts with Graeco-Latin Squares and puts constraints on the values of the variables so that the result is a magic square. The name Latin Squares, however, only came up in a later paper from Euler about Latin Squares titled Recherches sur une nouvelle espece de quarre magique (English: Investigations on A New Species of Magic Square). Euler put Latin letters into a grid, and called it a Latin square. Later, when he added Greek letters, he called it a Greco-Latin square. Spending the last years of his life dealing with the different possibilities of Magic Squares, Euler was faced with the special problem to combine two sets of n symbols each so that neither in a row nor in a line a pair of symbols occurred twice. He demonstrated methods for constructing Graeco-Latin Squares where n is odd or a multiple of 4. Observing that no order-2 square exists and unable to construct an order-6 square, he conjectured that none exist when n ≡ 2 (mod 4). Indeed, the non-existence of order-6 squares was definitely confirmed in 1901 by the French mathematician Gaston Tarry through exhaustive enumeration of all possible arrangements of symbols. It was only 58 years later, in 1959 and with the help of computers, when two American mathematicians named Bose and Shrikhande, found some counterexamples to Euler's conjecture. At the same year, Parker found a counterexample of order 10. In 1960, Parker, Bose and Shrikhande showed Euler's conjecture to be false for all n ≥ 10. Thus, Graeco-Latin Squares exist for all orders n ≥ 3 except n = 6. Sudoku puzzles are actually a special case of Latin Squares; any solution to a Sudoku puzzle is a Latin Square. Yet, classic 9x9 Sudoku impose the additional restriction that 3×3 subgroups must also contain the digits 1–9. According to a research done by Will Shortz and quoted by Dr Jean-Paul Delahaye in his Scientific American June 2006 story "The Science of Sudoku", the first modern shaped Sudoku puzzle was created by an American architect named Howard Garns after he retired from the Daggett architecture firm in Indianapolis. Garns took Euler's Latin Square concept and applied it to a 9x9 grid with the addition of nine 3x3 sub-grids, or boxes, each containing all numbers from 1 to 9. The first puzzles by Garns appeared in the May 1979 edition of Dell Pencil Puzzles and Word Games under the name Number Place, as they are still called by this company until today. Even though Dell did not publish Garns' name on the puzzle, according to Shortz's research it appeared in the list of contributors at the front of the magazine whenever Number Place appeared, and was absent from all other editions. There are also other references indicating Howard Garns was the first modern Sudoku creator. According to a Wikipedia article dedicated to Garns, a draftsman for the Daggett architecture firm named George Wiley told Indianapolis Monthly: "We had two extra drawing boards and one day Howard was sitting over there. I walked over and asked what he was working on and he said, 'Oh, a game'. It looked like a crossword puzzle but it had numbers. It had little squares. I walked around on his side and he covered it up. It was a secret." Another co-worker at the firm named Robert Hindman corroborated the story testifying he saw "sketches" of what he thought was a crossword puzzle. "I wasn't really interested in it" Hindman said, "But it was his thing. He just loved doing it." Garns died of cancer on October 6, 1989 and is buried in Crown Hill Cemetery, Indianapolis. So, the Sudoku concept was not invented in Japan as many people may believe, but the name Sudoku was. In 1984 Nikoli, Japan’s leading puzzle creating company, discovered Dell’s Number Place and decided to present them to their Japanese puzzle fans. The puzzles, which were first named Suuji Wa Dokushin Ni Kagiru, ("the numbers must be single" or "the numbers must occur only once") quickly became popular. In 1986, after some important improvements were added, mainly by making symmetrical patterns and reducing the number of given clues, Sudoku became one of the best selling puzzles in Japan. Realizing that the only problem with the Sudoku puzzles was their long name, Kaji Maki, the president of Nikoli abbreviated it to Sudoku - (Su = number, digit; Doku = single, unmarried). Today there are more than 600,000 copies of Sudoku magazines published solely in Japan every month. In contrast to the above, during all that time hardly anyone in Europe knew or paid any attention to the Sudoku puzzles. The publishing of Sudoku in the London Times was just the beginning of an enormous phenomenon which swiftly spread all over Britain and its affiliate countries of Australia and New Zealand. Three days later The Daily Mail began publishing Sudoku puzzles titled as "Codenumber". The Daily Telegraph of Sydney followed on 20 May 2005. By the end of May 2005 the puzzle was regularly published in many national newspapers in the UK, including The Daily Telegraph, The Independent, The Guardian, The Sun and The Daily Mirror. But that was not it. In July 2005 Channel 4 included a daily Sudoku game in their Teletext service and Sky One launched the world's largest Sudoku puzzle – a 275 foot (84 meter) square puzzle, carved in the side of a hill in Chipping Sodbury, near Bristol. The BBC Radio 4's Today began reading numbers aloud in the first Sudoku radio version. Famous British celebrities as Big Brother's Jade Goody and Carol Vorderman, that her book How to do Sudoku is the best-selling book in the country, have testified to its benefits as a mental workout. Even the Teachers magazine which is backed by the government recommended Sudoku as brain exercise in classrooms and suggestions have been made that Sudoku solving is capable of slowing the progression of brain disorder conditions such as Alzheimer's. In April 2005 Sudoku completed a full circle and arrived back to Manhattan as a regular feature in the New York Post. On Monday, July 11, the Sudoku craze spread to other parts of the USA when both The Daily News and USA Today launched Sudoku puzzles on the same day. In both cases the Sudoku puzzles were instead of traditional crosswords and bridge columns. By 2006 the Sudoku boom sprouted hundreds of puzzle books and magazines, Sudoku clubs, chat rooms, strategy books, videos, mobile phone games, card games, board games, calendars, merchandising products and even a Sudoku TV game show. Sudoku has also sprung up in thousands of daily newspapers all over the world and is commonly described in the world media as "the Rubik's cube of the 21st century" and as the "fastest growing puzzle in the world". 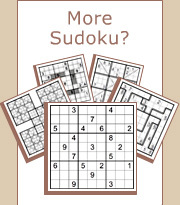 The Sudoku boom also sprouted a huge range of variants including smaller and larger grids, multiple overlayed grids, grids with diagonals and odd or even cells, grids with irregular shaped boxes, and many more. Some of these variants are very interesting and sophisticated, maintaining Sudoku's position as the most popular logic puzzle in the world. In March 2006, the first World Sudoku Championship (WSC) organized by the World Puzzle Federation (WPF) was held in Lucca, Italy. After solving 45 Sudoku puzzles including Classic Sudoku, Mini Sudoku, Diagonal Sudoku, Irregular Sudoku, Sum Sudoku, Multi Sudoku, OddEven and a dozen other variations during two days, the tournament was won by Jana Tylova, a 31-year-old economist from Czech Republic. Thomas Snyder, 26, a Harvard University graduate student, came second while Wei-Hwa Huang, 30, a software engineer from California working for Google was the third winner. Today, dedicated and mixed puzzle magazines with Sudoku and Sudoku variants by Conceptis are published regularly in over 35 countries including USA, Japan, the UK, Germany, Netherlands, Canada, France, Russia, Poland, Finland, Denmark, Israel, Hungary, Austria, Spain, Norway, Sweden, Greece, Switzerland, Belgium, Italy, Australia, New Zealand, Czech Republic, Brazil, Turkey, Korea, Thailand, Romania, Philippines, Estonia, Latvia, Peru and more.